This is the OE version of my ws. 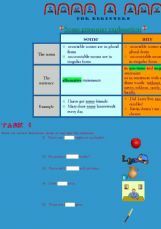 This way you can give these tasks as HW for example. These tasks help your ss practise how and when to use some and any. Hope you find them useful. Have a nice weekend. Hugs, Zsuzsapszi.